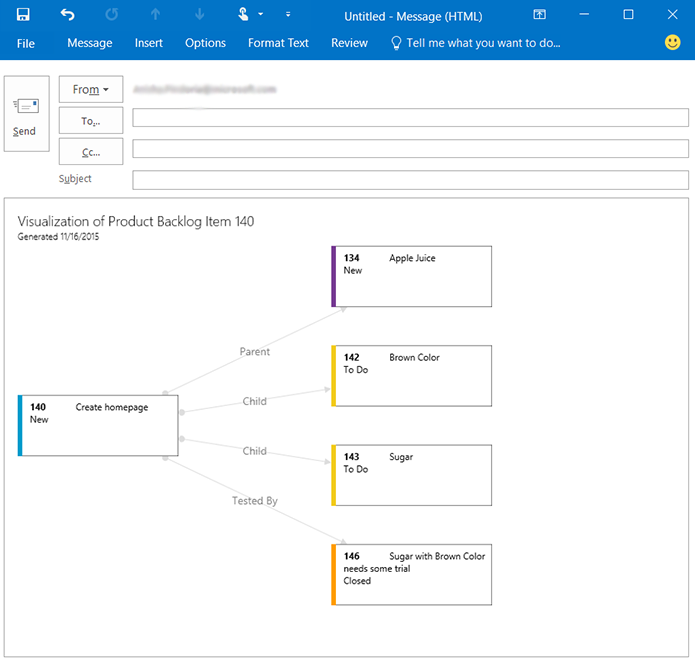 Visualize relationships between work items from within the work item form. In Visual Studio Team Services you can add, edit and display work items in query results and various boards. 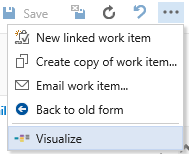 With this extension you can visualize these work items from within the work item form. If you are using the classic WI item form, select Visualize on the toolbar. Otherwise click on ... and select Visualize. 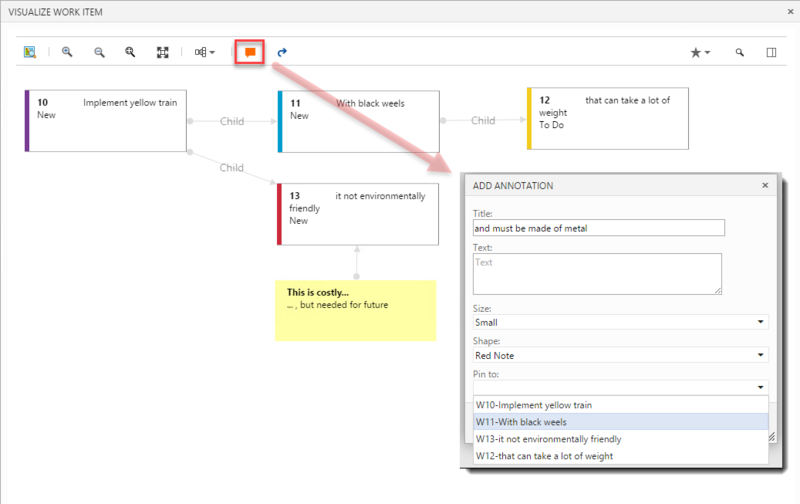 Visualization dialog will open up with the selected work item and its direct links expanded. Left click on the card on the graph to expand its links. Right click on a card on the graph to open the item in a new window. Click on Zoom In, Zoom Out, Zoom to original size or Fit To icons on the toolbar to re-size. 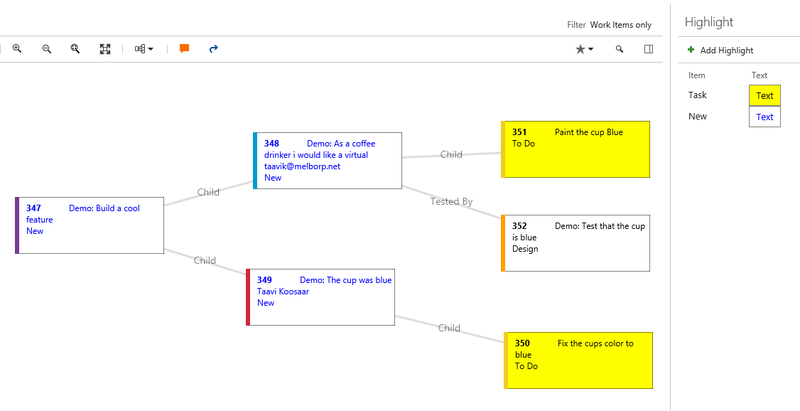 Open backlog or Create / Open a Query. Select one or many work items. 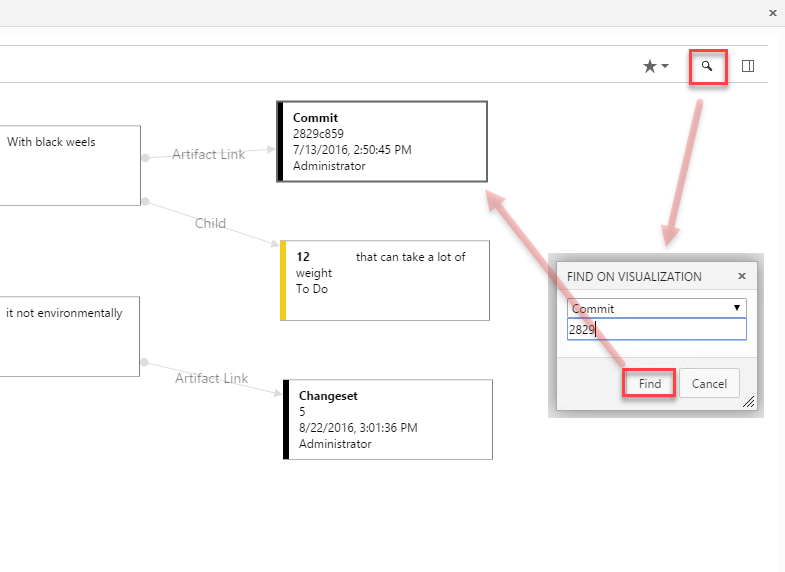 Right Click and open context menu, select Visualize. Click on the Toggle Legend Pane icon on the right. A pane will expand. Click on add highlight. A modal dialog will open to add. Select Work Item Type, Feature, and enter color (ie. red) in text color. Click Save to apply the highlighting. You can visually see how work items relate to each other, as well as code, tests, test results, builds and external artifacts. Even drill into your commits to explore the changeset details. 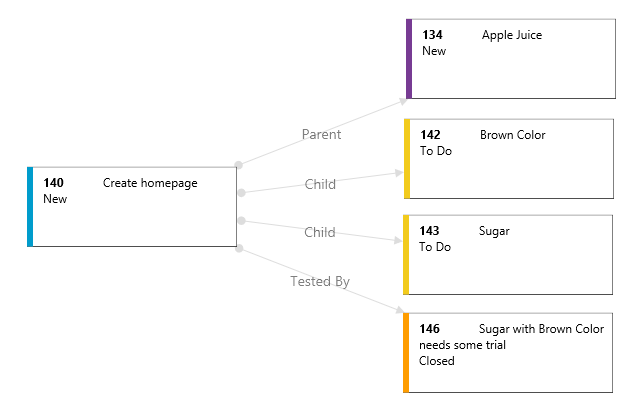 Use colors to highlight important work item types within your visualization. Use Zoom In, Zoom Out, Zoom to original size or Fit To toolbar icons to zoom in and out of your chart. Switch the orientation of your chart between horizontal and vertical view. Export your chart visualization for offline viewing or printing. 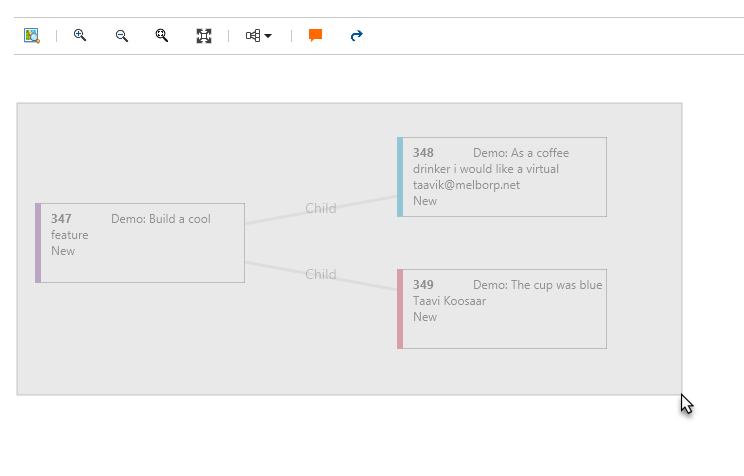 Add additional annotations to the visualizations and pin them to the items on visualization. 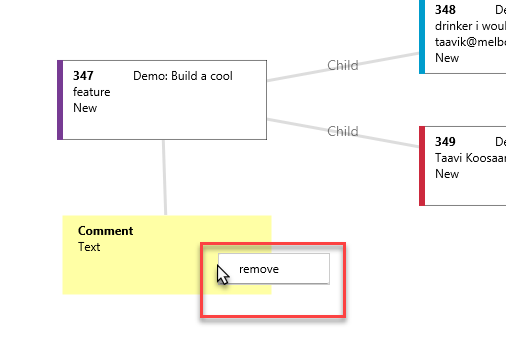 Remove annotations through context menu. Updated - This is an early version with limited functionality. Please provide feedback. 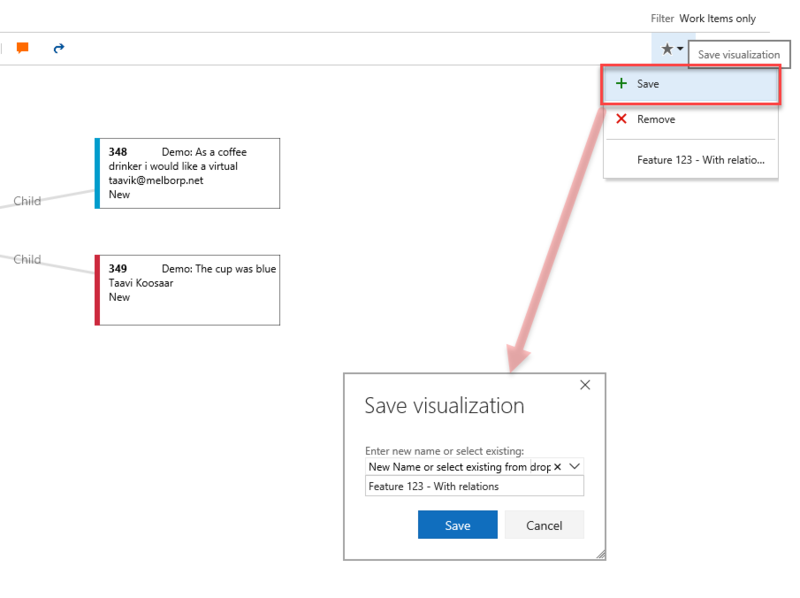 Save a new visualization or update existing saved visualizations on project level. New - This is an early version with limited functionality. Please provide feedback. 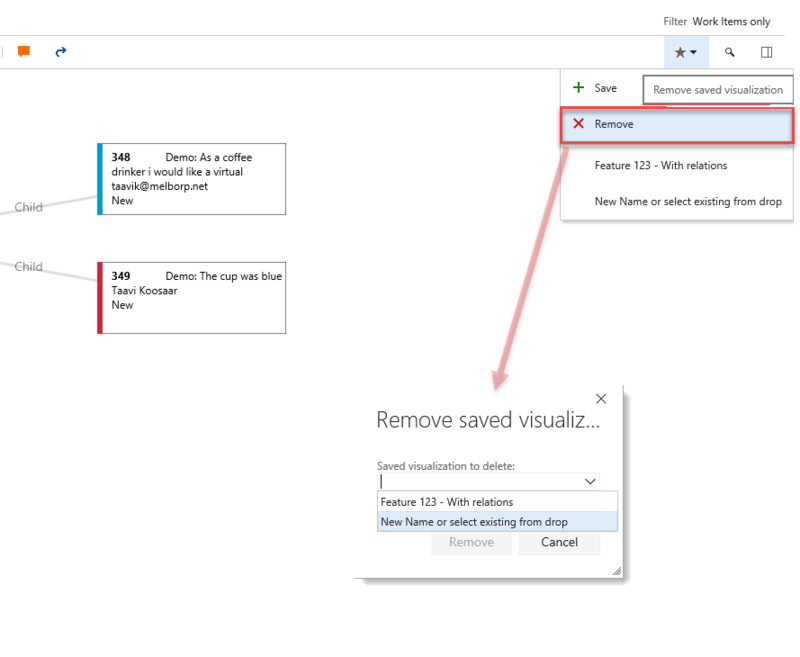 You can now also remove saved visualization. Previously the find on visualization allowed to enter and id and start visualization from it. Since we have visualization possible from all contexts now we deemed this unnecessary and thought it may be more useful to allow searching items on the visualization instead. 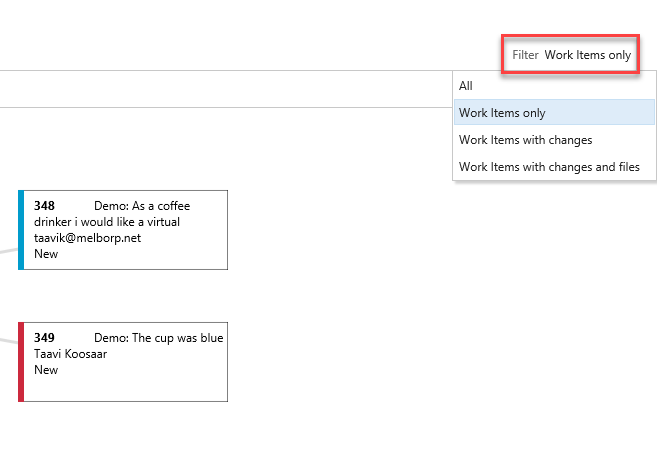 We now support filtering items on visualization by All, Work Items Only, Work Items with Changes and Work Items with Changes and Files. New - You can now Zoom by scrolling or pinching (touch). You can also do box selection with ctrl + mouse. We thank the following contributor(s) for this extension: Jeff Levinson, Taavi Koosaar and Mattias Sköld. Review the list of features and resolved issues of latest tools and extensions for more information on latest releases.